You just went to see your local dentist, and found out that you need implants. What exactly are implants? How much is this going to cost? This sounds extremely painful, how much pain should I expect? 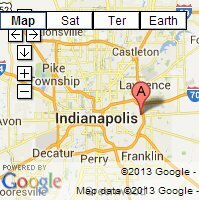 Who is the best Indianapolis dental implants dentist? These are probably some of the questions that are racing through your head after learning about your future with dental implants. Take a deep breath, the staff at Indy Family Dentist and Dr. Goldsmith are here to help you navigate the world of dental implants in Indianapolis and make the process less daunting. Dental implants are used to replace missing teeth due to an accident, periodontal disease, or some other reasons. An implant is an artificial tooth root (generally a titanium screw) that is screwed into your jaw which allows an artificial tooth or bridge to be attached. Your biggest questions is probably: how much are my implants going to cost? This is the most difficult question to answer because there are so many variables involved, however we strive to make the price affordable and work with all kinds of insurance providers. The price includes the implant, abutment (the part that attaches the crown or bridge to the implant), crown and the surgery to install the implant. Why are implants so expensive? Implants are expensive because they fall under restorative dentistry. Which means that you are paying for specialty services, which are performed by either a periodontist, an oral surgeon, or a dentist who has advanced training in implantation. Some dentist will require that you are placed under general anesthetic for the procedure, which can drive the cost of the implant up. It is important when meeting with your dentist or oral surgeon for consultation that you get a price on the whole procedure. Some dentist or oral surgeons will only give you the cost of the implant itself and not include the crown, or the abutment. In some cases it might be necessary to ask to see a price break down of the procedure to see how much each component will cost and to ensure that the price is all inclusive. How painful each implant is will vary from patient to patient. Implants are a major dental procedure, and like most major procedures, some discomfort and pain are to be expected during the healing process. Depending on the location of the implant, there could be some pain or discomfort in the chin, cheeks, or possibly under the eye. During the healing process, the pain and discomfort should be manageable, follow the post procedure instructions that you are given by your dentist or surgeon. Most will recommend to take an over the counter painkiller, such as, Ibuprophen to help with the pain and swelling. Placing an ice pack on your cheek or lips as soon as you get home will also help with swelling. Overall, expect some pain and discomfort following the procedure. Most patients who have had implants say that the pain is well worth the end results; so when you’re really feeling it just remember that it will all be worth it in the end! As Indianapolis dental implants premier dentist, Dr. Goldsmith has been heavily involved in continuing education throughout his entire career, utilizing state-of-the-art technology and techniques, so you can be confident that you will be getting the best treatment possible. Dr. Goldsmith prides himself on providing affordable dental solutions. So if you are looking for affordable dental implants in Indianapolis, contact Indy Family Dentist today 317-357-4018 to schedule a consultation.